There’s some great Pennsylvania pipeline news from both sides of the Commonwealth as Range Resources exploits good planning and a pipelines reverse flow. MDN recently received an email from a subscriber who lives in Southwestern Pennsylvania. Her land is leased to Range Resources, and she recently read that Range “now has their own pipelines to carry Marcellus gas to better paying markets.” In our response to her, we mentioned that, although producers sometimes buy a share of a pipeline, they rarely own pipelines outright. More often they sign long-term (10-20 year) agreements with large midstream companies to reserve capacity along pipelines. We went looking for which pipelines Range might have reserved capacity on that are near where Sandy lives, and found two things that caught our attention. One is a recent statement from Range bragging (our word) about a strategy they put in place 10 years ago to get enough pipeline capacity to move Marcellus gas out of the region to better paying markets. The second thing is that we located a list of major northeast pipeline projects with the pipelines Range has reserved capacity along highlighted in yellow. Cool! 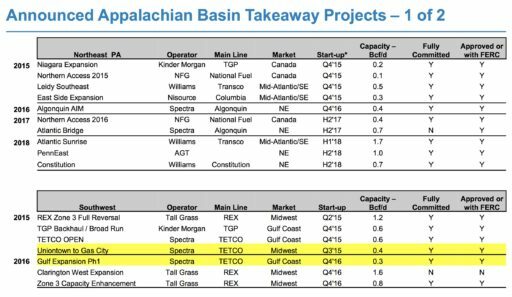 The Pittsburgh Post-Gazette also ran an article mentioning some of the pipelines Range says will be a game-changer for them in the near-term, followed by that list of pipelines they have reserved capacity along. Ten years’ worth of planning and execution here in the Marcellus Shale are about to fall into place for Range Resources Corp. Range (NYSE: RRC), one of the biggest natural gas producers in southwestern Pennsylvania, is about to see the completion of pipeline projects that will allow it to ship a lot of its natural gas and natural gas liquids like ethane and propane out of the region. That’s important because shipping to the Gulf Coast, Midwest and overseas will allow Range to get better prices — and take advantage of increasing demand — than it would selling the gas locally. The pipelines will be online by early 2018. It’s been a decade in coming, said Ray Walker, COO of Fort Worth, Texas-based Range, in a separate interview. A big story for Range this year and into next is the completion of the infrastructure programs. By the end of the year, two will be operational — Rayne/Leach Xpress (TransCanada) and Tetco Adair Southwest (Enbridge) — and early next year will see the Rover Phase 2 pipeline operational by Energy Transfer Partners. Those projects will bring Appalachian gas to the Midwest, Gulf Coast and Ontario. By 2018, Range will be transporting more than 90 percent of its gas out of southwestern Pennsylvania and getting a higher price for it than if it had stayed locally; 70 percent of it goes to the Gulf Coast. Range is also set up well, via the Mariner East 1 pipeline, to continue to export ethane and propane to foreign markets from Marcus Hook terminal near Philadelphia as it has since 2016. 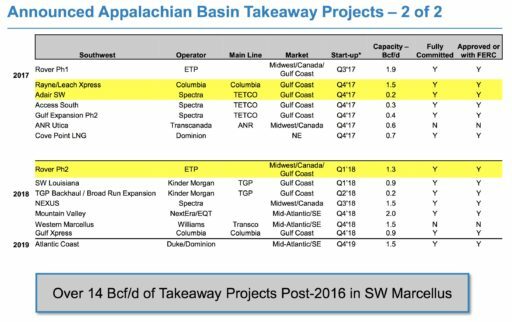 And, here are two sides from Range’s 3Q17 report The pipelines Range reserved capacity along are highlighted in yellow. That’s great news but it isn’t all. We have a brand new pipeline project to tell you about–located in the Greater Philadelphia area. Although the project is new, the pipeline is old–already in the ground. Talen Energy, birthed in June 2015 from a combination between PPL Energy Supply and certain assets of Riverstone Holdings, is one of the largest competitive energy and power generation companies in North America. Talen’s core business is building and operating electric generating power plants. One of the assets Talen inherited in the merger is an 84-mile pipeline called the Interstate Energy Company which runs from Northampton County, PA through Bucks, Montgomery, and Chester counties, terminating in Delaware County at Marcus Hook. Talen announced yesterday they’ve sold the Interstate Energy Company (the pipeline) to Adelphia Gateway, a subsidiary of New Jersey Resources, for $189 million. The northern 34 miles of the pipeline was converted to flow natural gas back in 1996. The southern 50 miles currently flows oil, but Adelphia (NJ Resources) announced yesterday they will convert the oil portion of the pipeline to instead flow natural gas. The bottom line is that a wide swath of Greater Philly is about to get a new source of clean-burning, abundant fracked PA natural gas. 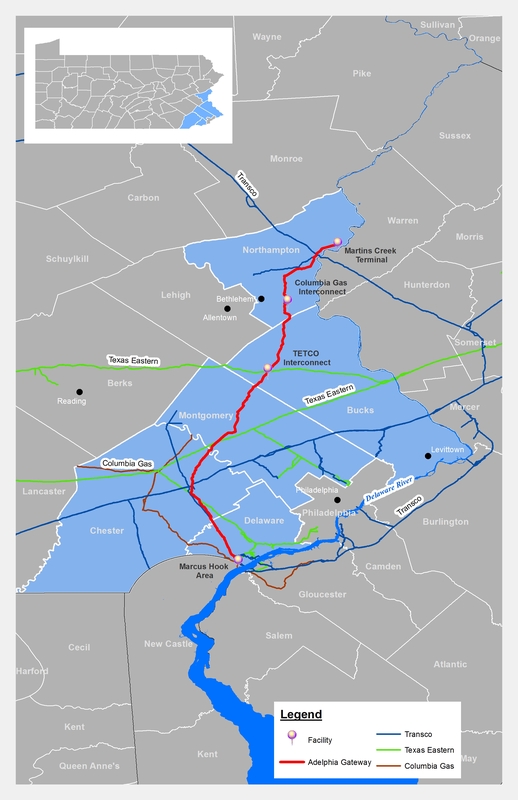 A petroleum pipeline that encircles the Pennsylvania suburbs around Philadelphia will be converted to deliver natural gas from Bucks County to Marcus Hook under a $189 million deal announced Thursday between Talen Energy Corp. and New Jersey Resources Corp.
Talen, which is based in Allentown, is selling its Interstate Energy Co. LLC pipeline unit to Adelphia Gateway, LLC, a subsidiary of New Jersey Resources, which is based in Wall, N.J. The 84-mile underground pipeline was now delivers either oil or natural gas to two Talen power plants in Northampton County. Adelphia Gateway plans to convert the southern 50-mile portion of the pipeline, which now transports oil in a northern direction, to transport gas southward to customers in Montgomery, Chester and Delaware Counties. Adelphia on Thursday launched an “open season” to solicit bids from potential new customers. Adelphia will to continue to supply natural gas on the northern 34-mile section of pipe to Talen Energy’s Martins Creek and Lower Mount Bethel generating stations. The pipeline was built in the 1970s to deliver oil from Sunoco’s former Marcus Hook refinery to power plants owned by Pennsylvania Power & Light Co. It was partly converted to natural gas in 1996. With the refinery’s closure and oil’s fall from favor as a fuel source for electricity generation, the pipeline becomes the latest piece of energy infrastructure converted to accommodate new gas production from Pennsylvania’s Marcellus Shale fields. The sale requires the approval of the Federal Energy Regulatory Commission and the Pennsylvania Public Utility Commission, and is expected take about a year to close. New Jersey Resources (NYSE: NJR) today announced its subsidiary, Adelphia Gateway, LLC, has entered into an agreement with Talen Generation, LLC (Talen Generation), a subsidiary of Talen Energy Corporation, to purchase all of Talen Generation’s membership interests in Interstate Energy Company LLC, which owns and operates an existing 84-mile pipeline in southeastern Pennsylvania, for an estimated $166 million, plus additional contingent payments of up to $23 million based on certain specified conditions. The transaction is expected to close following receipt of all necessary permits and regulatory actions, including those from the Federal Energy Regulatory Commission and the Pennsylvania Public Utility Commission. NJR’s Adelphia Gateway project will repurpose the southern 50-mile portion of the pipeline to flow natural gas and provide customers in the greater Philadelphia region with a needed, new source of clean, safe, low-cost supply. This innovative approach utilizes existing infrastructure to meet market demand with minimal new construction or impact to the environment. Once converted, the pipeline will be able to transport an incremental 250,000 dekatherms per day, approximately 91 million dekatherms per year, of natural gas to the greater Philadelphia market. The northern 34 miles of the pipeline, extending from western Bucks County to Northampton County, were converted to deliver natural gas in 1996. Originally constructed in the 1970s to transport oil, the 18-inch diameter pipeline runs through Pennsylvania from Marcus Hook, just south of Philadelphia, north to Martins Creek, Pennsylvania. For more information on the Adelphia Gateway project, visit AdelphiaGateway.com. As you can see in the NJR press release, they’ve already created a website for the project: AdelphiaGateway.com. How long do you think it will take for anti opposition to arise from THE Delaware Riverkeeper, Sierra Club, et al ad nauseam? We give it a day or two at most.